I was rudely reminded on Sunday morning that at this time of year you need to avoid magpie attack while riding your bike, when an angry bird swooped me, clipping the back of my helmet. While he did me no harm, I could have overreacted and crashed my bike!! You see it’s Spring in my home town of Sydney, and while it’s an awesome time of the year to ride a bike, it also means that there are a lot of angry birds swooping cyclists in the next couple of months. Magpies seem to get most of the mentions, but in my local area there are a couple of very vicious butcherbirds that re-emerge at this time of year to protect their babies. Native birds such as Australian Magpies are highly protective of their eggs, nest and young and will often swoop at unsuspecting passers-by if they feel threatened. Other native Australian birds that are also common culprits include butcherbirds, kookaburras and plovers, but even invasive species like Indian Mynas can attack at this time of year. Magpies seem to cop the majority of the blame but from my experience butcherbirds are more vicious. 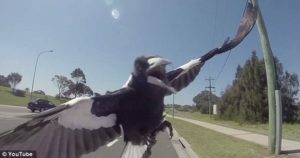 New research has found magpies are able to use facial recognition to determine who they target. Griffith University behavioural ecologist Dr Darryl Jones said magpies were able to recognise people by their facial features, remember people who regularly passed through their territory, and could distinguish between those different people. Dr Jones said while it could feel like magpies everywhere were bloodthirsty, only a small portion of magpies actually attacked people. “Only around 10 per cent of magpies attack, and of that about half of them target pedestrians. The remaining half go for either cyclists or posties and there’s a very, very small group of magpies that just attack everybody,” said Dr Jones. Good news indeed. Share the information about locations of attacking birds with fellow cyclists via social media, forums and websites. I found a good one where you can report bird attacks called Magpie Alert. You could also share the information on Facebook pages for your local cycling group and other ways you communicate with fellow cyclists. Putting cable ties on your helmet that stick up to deflect the swooping bird doesn’t appear to work. I’ve found no conclusive evidence in my research and frankly I’d rather take the risk than look like a dork. Share your experiences of magpie attack while riding your bike via the comments or the Women Who Cycle Facebook page. Next Post:Been looking for the ideal cycling holiday in the south of France?